Skin Solace contains Roman Chamomile, a natural analgesic which has been traditionally used on irritated skin conditions like sunburn, Eczema and Psoriasis. Calendula Oil is gentle to the skin and could help speed the healing process. Most importantly Skin Solace has a huge Aloe Vera content. 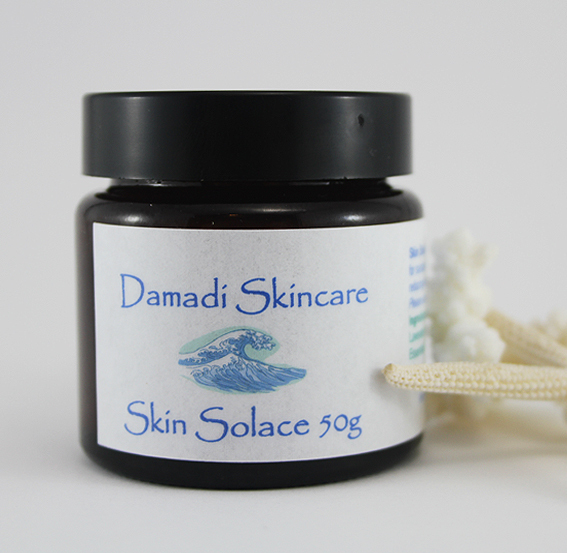 While this product was made with sensitive skin in mind some Damadi customers who love Roman Chamomiles slightly herbal and fruity scent use it as a facial moisturiser, even though their skin is perfect. Application– Apply gently to unbroken, red or irritated skin. Skin Solace can be used anywhere on the body, not just the face. - If the skin feels hot or prickly, then you are still burning. - Try to drop the heat of the skin as quickly as possible by soaking in a cool bath or pool for at least 10 minutes. This may also helps prevent peeling later. - Wring out a tea towel or hand towel in cold water and leave it in the freezer for ten minutes until it's chilly. Don’t worry if it goes stiff it won’t take long to thaw on sunburn. When cold, place it on the burnt skin – it feels wonderful! - Avoid putting oils on burnt skin. - Use Skin Solace or fresh Aloe Vera gel straight from the plant if available. If you’re lucky enough to have access to the fresh Aloe, split open the leaf and scrap out the clear gel in the centre. Try not to get any of the green or yellow sap mixed in with the clear gel as this part is not helpful to the skin. Fresh Leaf Aloe has a slightly unusual texture, best described as being slimy, but if you have really bad sunburn you probably won’t care. - Skin Solace can also be used on insect bites. Really moisturising for dry skin. Love it!